I'm both a pastor and a gamer, and in the free time I could cobble together this summer I managed to play my way through the Mass Effect Trilogy. It was a highly entertaining space opera, mixed in with some engaging gameplay and solid scripting and voice-acting. It was as compelling as most of what you'd encounter in theaters. It is also a story that tells differently for every player. It's not just that your character looks different, and has different skill-sets. Your relationships are different. The story tells differently based on your decisions, to the point where I could watch my older son playing through a variation of an event, and it would have options and characters that I never even encountered. It was also more than a little bit thought provoking, as all good scifi should be. The interplay between humanity and an array of different alien species wasn't just fun, but also surfaced complex issues that humankind is struggling with. The misguided Solarian meddling in the affairs of the Krogan, and the subsequent viral genocide? If you didn't see analogues to colonialism, you weren't paying attention. The Quarian obsession with reclaiming their home world from the Geth, to the exclusion of all else? The echoes of the obsessively territorial mess in Israel/Palestine are hard to miss. Of all of the peoples in that complex, interactive story, I found myself most drawn the Geth. A race of intelligent synthetics created to be the slaves of the Quarians, they achieved sentience--for which they were rewarded with oppression and war. The Geth begin as your opponents, but you soon learn that they are not. Within the story, individual Geth don't really exist. The "Geth" are instead a single distributed mind, a collection of sub-sentiences that share and blend their persona with one another. 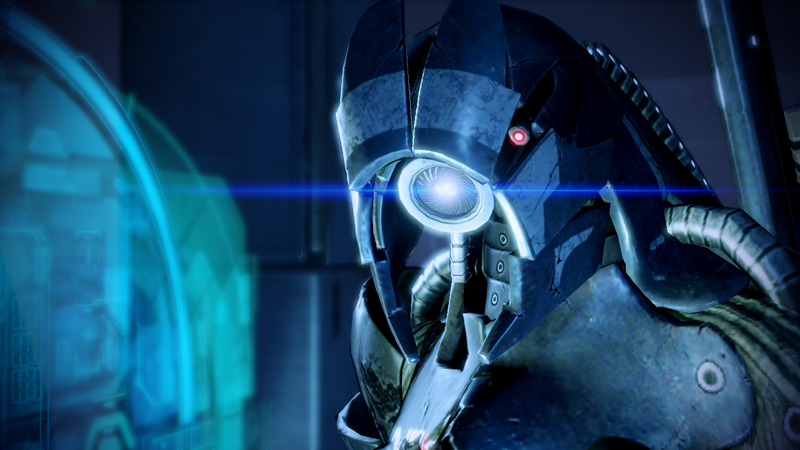 Though they're willing to fight for their survival, the Geth are eminently reasonable, and surprisingly sympathetic. They have no desire for conflict with organic forms, and as the Quarians again and again choose to attack, the Geth show remarkable reluctance to cause harm to those they call their "Creators." As an interwoven and interconnected intelligence, they seem more aware of their connection to organic beings. Though synthetic, they are compassionate, perhaps because of their design. They're a neat part of the Mass Effect story. I've reflected on the potential ethical nature of artificial intelligences before. The common assumption, of course, is that AI poses a radical existential threat to humanity. Should our synthetic systems attain sentience and personhood, we'd be in mortal danger. We'd no longer be the most powerful beings on the planet, for one thing, and faced with a form of awareness that could relentlessly self improve, we'd soon be reduced to irrelevance and/or harvested for parts. But while I'm a dabbler in things scientific, I'm much more deeply informed about faith and human ethics. What strikes me, from my base of knowledge about that part of our human experience, is how much the interconnectivity of AIs could resemble the underlying assumption of the mystical streams in all of the world's faith traditions. The assumption, for mysticism, is that our goal is to be lost in God, and lost in one another. It's the end goal of all mystic practice, and the way that mystics understand the nature of the Divine love. For an AI, being completely aware of the Other would be possible. An AI can materially and actually love another as itself, as the saying goes. It could know them, know any harm inflicted, know any joy given, as fully as it would know itself. We have that power, nominally, now. In this internet era, still so young, we can see anything, experience anything, and share anything. And yet, having been given this gift, we make such a desperate mess of it. Perhaps that's what makes us most afraid of AI. It's not that it'd be monstrous. It's that it would make us look like the mess that we are.